Which is why we have developed our range of Pet Health Care Plans - designed to cover all the regular essentials such as vaccinations, worming and flea treatment, as well as 6-monthly check-ups with your vet. 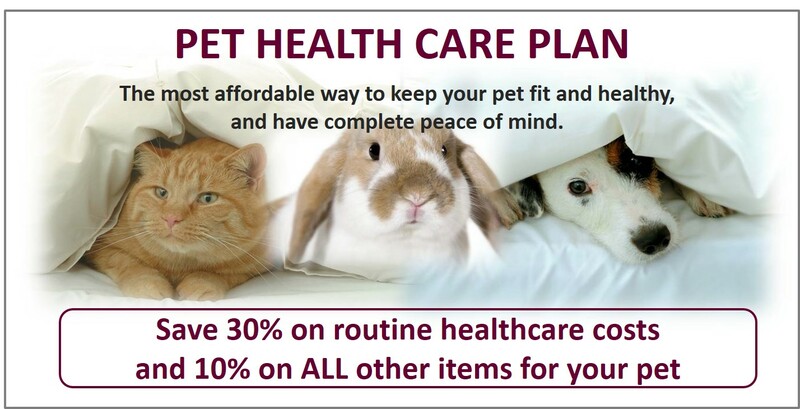 Join our Pet Health Care Plan today and save up to 30% off your annual routine veterinary care. In addition you will also receive an extra 10% off ALL other treatments, medicines and pet foods. If your cat or dog is not microchipped, we will also do that for Free. No additional charge for your pet's initial vaccination course. Our plan provides complete peace of mind, knowing that your pet is receiving the optimal routine preventative healthcare they need, whilst saving money. To join please pop in to your local Branch Surgery or Hospital. Please note the first month's payment is paid when joining the Plan with the subsequent monthly payments by Direct Debit. As you will need to complete and sign a Direct Debit form please bring with you the appropriate bank details. It is also possible to pay for the whole plan on joining by credit/debit card or cash. 1. Health checks are normally 6 monthly, but may be changed if your pet needs to be checked prior to prescribing flea or wormer products. 2. Includes Kennel Cough and initial Vaccination Course where appropriate. 3. Based on our Optimal Plans for cats, dogs & rabbits. 4. Rabbit claw clipping completed at health checks. Regular visits mean we can make sure we dispense accurate and up to date flea and worm treatments. It also gives us the opportunity to monitor the general health of your pet and be able to notice those often subtle changes that indicate something may be wrong. We will put together a Complete Care schedule specifically for your pet, detailing when your annual vaccination, 6 month health check, and flea and worm treatments are due.